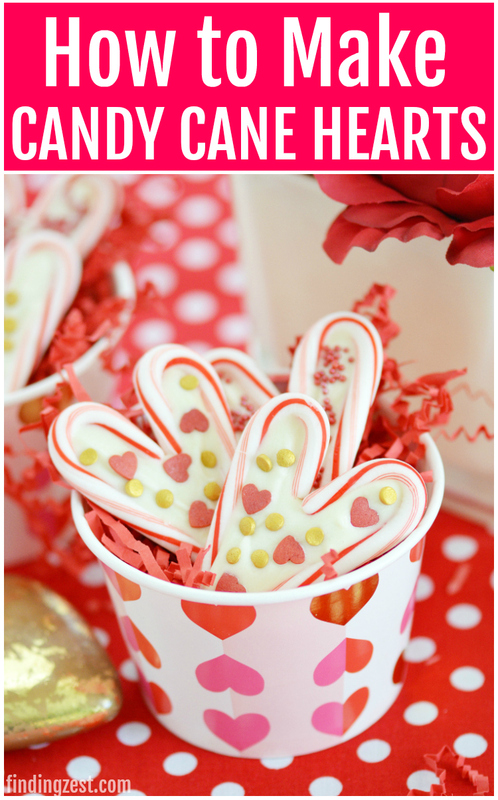 Learn how easy it is to create candy cane hearts, a perfect Valentine’s Day treat! Featuring colorful sprinkles, these candy cane hearts with white chocolate are a fun project to make with your kids. If you have ever wondered what to do with leftover candy canes, these treats are for you! I think we’ve all been there. The holidays are over and you are sitting with extra candy in your house. You wonder what to do with leftover candy canes that you never ate. This is especially true with the mini candy canes that come in these enormous packages of 100 or more. 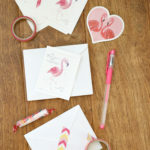 Why let those perfect red and white candy canes go do waste when the colors are perfect for Valentine’s Day? Two candy canes put together naturally create a heart shape. I used this cool feature to make candy cane reindeer a couple of years back. This same heart shape makes them the perfect candy to show someone you care this Valentine’s Day. 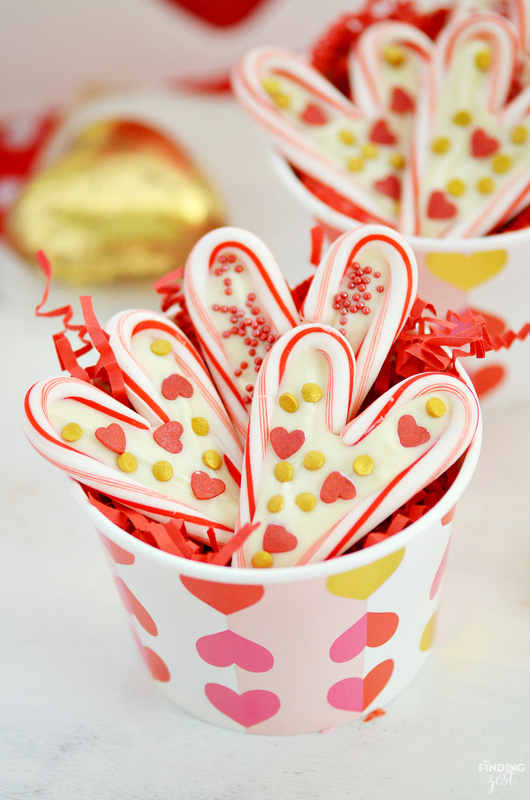 Make candy cane hearts filled with white chocolate and you’ve got a special treat. 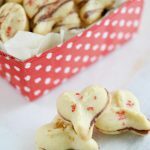 To make these candy cane heart treats you’ll need just a few ingredients. valentine sprinkles , crunch sprinkles or nonpareils. Making candy cane hearts is really simple. 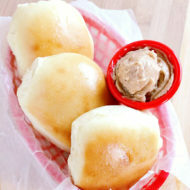 First you’ll want to line a baking sheet with parchment paper or a silicone baking sheet. I love using my silicone baking mats for chocolate treats! 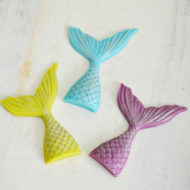 Nothing sticks to them and they can be washed and reused over and over. 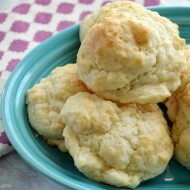 They also work great for baked good like cookies and biscuits. 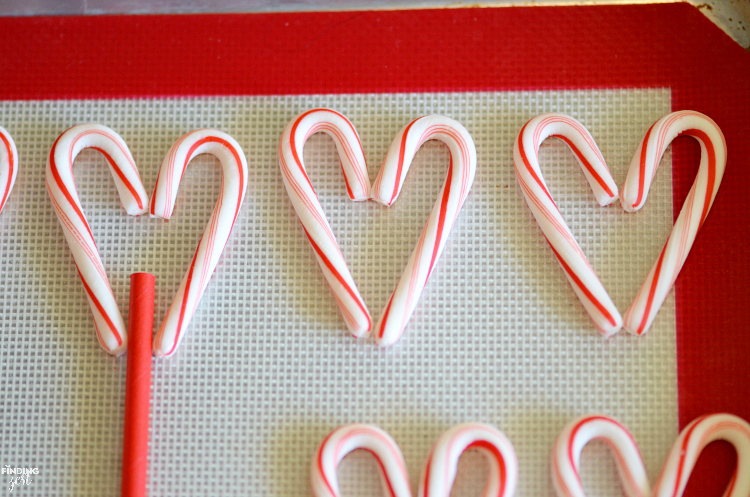 You can choose to make love heart candy canes with a stick or without. 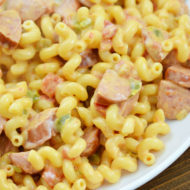 I made a combination of both and my kids loved them equally. I do think a lollipop stick makes them a bit less messy to eat but they are easier to store without one. 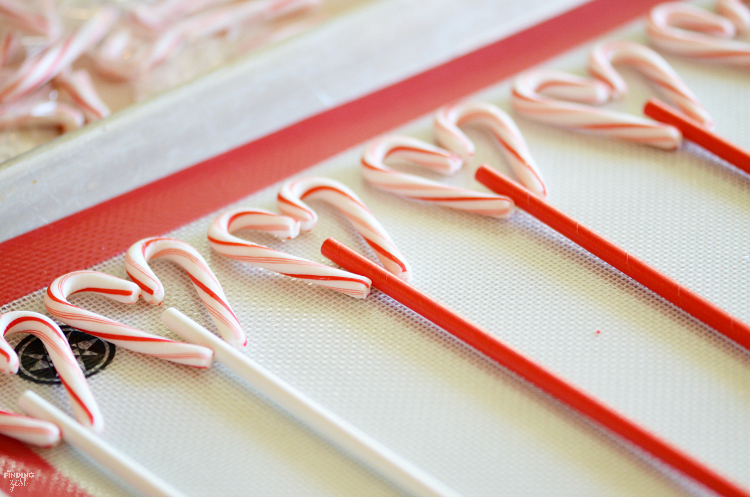 To make these into candy cane lollipops, place your candy stick in the center at the base of the heart. The end of the stick should be about half way up the heart so it can balance the weight of the chocolate and candy canes. Using a spoon or decorator’s bag, drop your melted chocolate into the center of the candy cane, being careful to not hit the sides. I recommend starting in the center and gently pushing the chocolate out using the tip of the spoon until it is even. Sorry, I didn’t take a picture of this process for this project. Before your chocolate sets, you’ll want to add sprinkles to the top. I used a combination of mini hearts and gold confetti sprinkles along with some red nonpareils. Sprinkles Tip: If you have a Michael’s store nearby you can find both mini hearts and gold confetti in small packages for just a dollar in store! This is such an inexpensive way to get all of your sprinkles and tailor the colors to exactly what you want with assorted jimmies, nonpareils, and fun shapes. 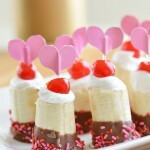 Another way to decorate and add more flavor to your candy cane hearts is with coconut. Since my kids absolutely love coconut I wanted to incorporate that on some of the candy cane pops. Dying coconut is really easy. All you will need is a sealed baggie and food dye. For this project you wouldn’t need a lot of coconut, perhaps 1/4 cup to 1/2 cup for each color, depending upon how many you made. 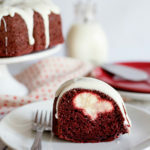 You could make extra and use it for other Valentine’s Day treats! To make, add coconut to your baggie and drop 2 to 3 drops of food dye. Seal it shut and shake it well until all the coconut is evenly colored. Once you’ve sprinkled whatever toppings you would like on your hearts, you’ll want to give your candy cane treats a chance to dry. You can do this at room temperature or you can speed up the process by placing your baking sheet in fridge for 15 minutes or so. 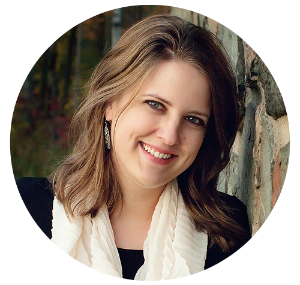 You’ll want to store them in an airtight container to keep them fresh. 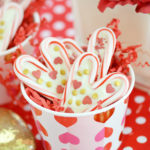 Learn how easy it is to create candy cane hearts, a perfect Valentine's Day treat! 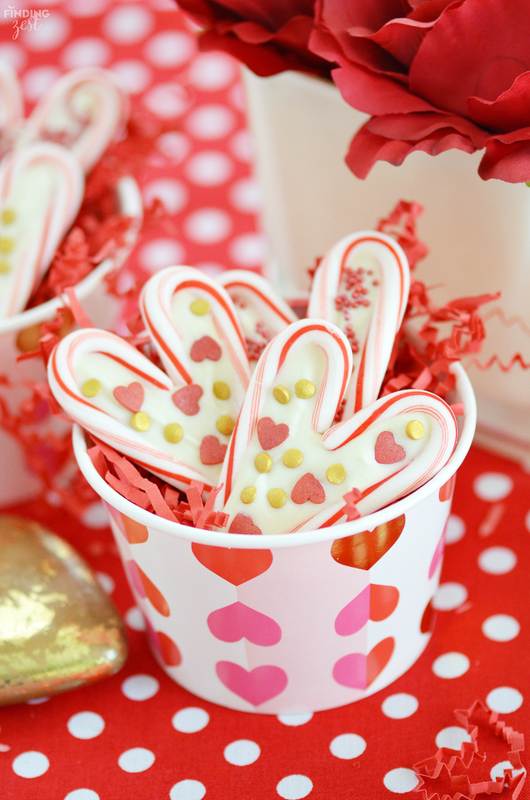 Featuring colorful sprinkles, these candy cane hearts with white chocolate are a fun project to make with your kids. 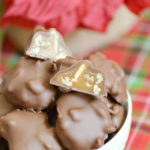 If you have ever wondered what to do with leftover candy canes, these treats are for you! 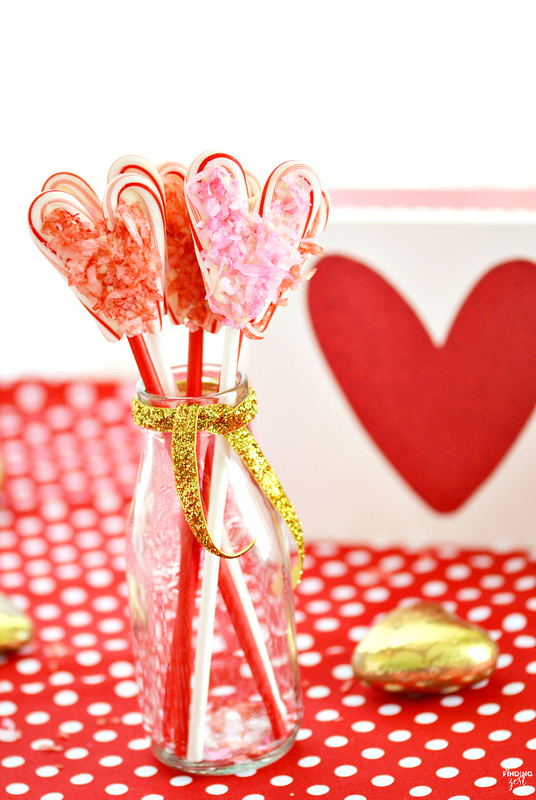 Lay candy canes in a heart shape around lollipop stick with the stick coming up halfway into the bottom of the heart. If making without a stick, lay ends together to form heart shape. Melt chocolate and oil in microwave in intervals, just until melted and stirring often. 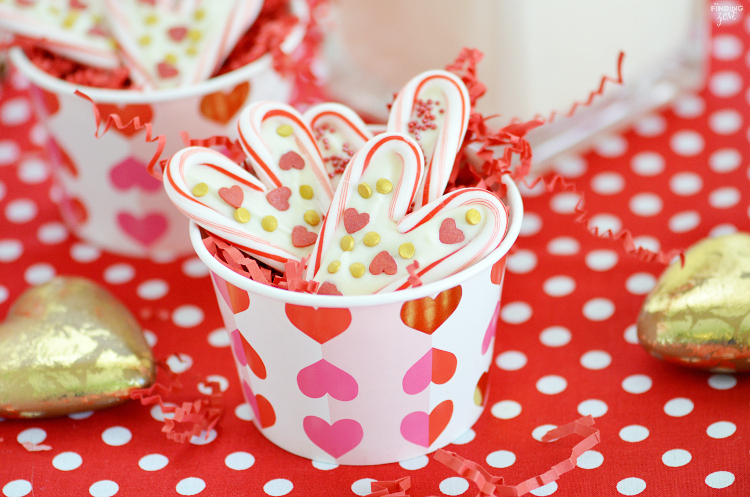 Add chocolate into a zipper baggie, snipping off end or use spoon to fill candy cane hearts with chocolate, including the lollipop stick if using them. Immediately add sprinkles, or coconut before chocolate has a chance to dry. 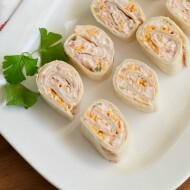 Let dry completely at room temperature or transfer to refrigerator for 15 minutes to set. 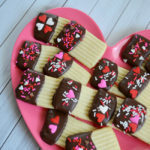 If you prepared these candy cane chocolate hearts for gift giving, there are several ways to present them that are fun. For candy cane pops, you can use a lollipop bag to place of over the top and seal them. If you made them without sticks you can place them in treat bags, party favor containers or treat cups like I’ve shown here and then use a larger treat bag to cover it. Still have more candy canes to use up? Try these dipped candy canes, perfect for serving with hot cocoa or eating as is! What do you like to make with leftover candy canes? What a fun craft with my kiddo that we can eat and enjoy after. Making some for her friends too! 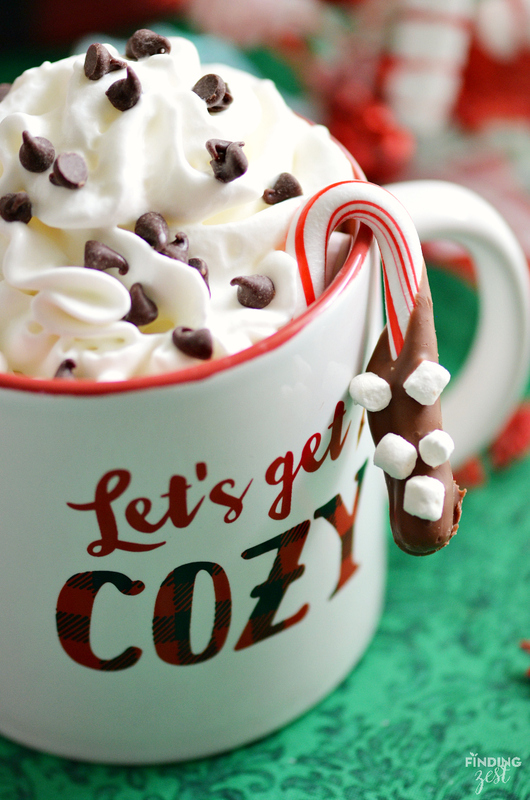 What a great use of all those leftover candy canes!